One of the tasks that every business owner has to deal with is accounting - and whether you intend to do your own bookkeeping/accounting or hire professionals you will need to become familiar with some basic accounting terms. Fiscal Year: A fiscal year is the 12 month period that constitutes the start and end of the annual financial records for a business. It does not necessarily correspond to the calendar year. For example, seasonal businesses such as farming often use a fiscal year that ends in the fall. Assets: Assets are anything of monetary value owned by the business. Typical tangible business assets include land, buildings, equipment, cash, vehicles, accounts receivable, etc. Intangible assets include client lists, franchise agreements, favorable finance or lease agreements, brand names, patents, copyrights, etc. Assets are expressed in terms of their cash value on balance sheets. Liabilities: Liabilities are financial obligations owed by the company, including salaries, income taxes, rents, utilities, interest payments, amounts owed to suppliers, etc. Liabilities can be short or long term and are grouped on balance sheets in order of classification. Revenue: A business's gross revenue is the sum of all monies generated through the sale of good and services, shares in the company, interest, royalties, property, etc. before subtracting expenses. Expenses: Expenses are costs incurred by a business to generate income. Expenses can be fixed (such as rents, salaries, etc.) or variable, e.g. those that fluctuate depending on sales or production cycles. Accounts Receivable: Accounts receivable are amounts of money owed to the business by customers/clients for goods and services rendered. Because the clients have a legal obligation to pay, the amounts are entered as an asset on the balance sheet. Capital (Also Known as Working Capital): Working capital is money that a company has available to pay bills or reinvest. It is equal to the value of all current assets minus liabilities and is considered a key measure of the health of a business. Bad Debt Expense: Bad debts are incurred when customers do not pay amounts owed. They are recorded as an expense on financial statements. Accruals: Accruals are revenues that are earned but not entered into the books (such as completed but not invoiced sales) or expenses that are incoming but not received (such as goods purchased but not yet invoiced for). Depreciation: Depreciation occurs as business assets such as vehicles and equipment decline in value over time due to use or obsolescence. 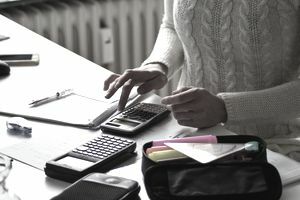 Depreciation is an important tax deduction––a percentage of the original value of the asset can be written off every year based on the rate of depreciation. Equity (Also Known as Owner's or Shareholder's Equity): Equity is the amount of money invested in the company by the owners (shareholders) minus any money taken out in the form of draws (not salary). Dividends: Dividends are distributions of a portion of company earnings to owners (shareholders) of the business. Dividends can be issued on a regular or non-regular basis and may consist of cash or additional shares in the business. For tax purposes, a business owner may prefer dividends to salary. Cash Basis Accounting: Cash basis accounting is a simple method of keeping track of revenue and expenses––revenue is recorded when the customer makes payment and expenses are recorded when paid out. It is most often used by sole proprietorships and small businesses that don't maintain inventory. If the customer pays by credit the revenue is not recorded until full payment is received, regardless of the invoice date. Similarly, if the business incurs an expense on credit, the expense is not recorded until the invoice is fully paid. Accrual Basis Accounting: Public companies and most businesses and professionals in the United States and Canada are required by law to use accrual basis accounting, which requires revenue to be recorded when the customer is invoiced and expenses to be recorded when they are incurred, rather than when the actual payments are made. Accrual Basis accounting gives a more accurate picture of the long-term health of the business. Balance Sheet: A balance sheet is a snapshot of a company’s financial status at a particular point in time. It is organized into two main columns, with assets in one column and liabilities and shareholders equity in the other. Cash Flow Statement: The Cash Flow Statement shows the movements of cash and cash equivalents in and out of the business. Most businesses that fail do so due to chronic cash flow problems. General Ledger: The general ledger is the complete recording of a company’s financial transactions over the lifetime of the organization, including assets, liabilities, revenue, expenses, and equity.